Let’s imagine a large cargo container, which would store electrical energy, and could be transported from a source of energy to anywhere it might be needed. The containers could be shipped by truck, rail or boat and would provide electrical energy, much like a gigantic battery. The concept of shippable energy containers might be more economical than long electrical transmission lines. The containers would “fill up” at some large energy farm and then be shipped to “filling stations” throughout the country. I’m going to assume that each container would store about 100,000 kilowatt-hours of energy. 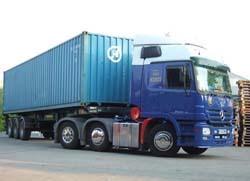 A special portion of the container would be reserved to power the electric truck, needed to transport the container. At $0.1 per kilowatt-hour, the filled container would haul about $10,000 worth of energy. Empty containers would be shipped back to the energy source, where they would be filled up again. The transportation “energy reserve” within the container would be used to power the truck hauling the device. Perhaps, the reserve would be designed so once half the total energy in the reserve was used up, energy would then be pulled from the main storage unit. This would insure that there would always be a 50% hauling energy margin in each unit. Maybe the reserve would store about 1% of the total container storage or about 1MW hours. For those containers which are stationary for a month or more, a large solar panel might be mounted on top of the container, to charge up the energy reserve portion, while the container was parked. Once the reserve was charged up, any additional energy would flow into the main container storage. Perhaps as much as 4KW of solar panel power could be on the container top. Assuming 6 hours of sunlight per day, such a panel would produce 24KW-hours of energy per day. If the container was stationary for 30 days, the solar panel would pump 720KW-hours of energy into the unit. That should be plenty of energy to get the container back to the energy farm. Is 1000KW hours enough energy for the electric hauling truck? Many hybrid cars claim a 40 mile range with about 20KW hours of battery storage.1000KW hours would be 50 times more massive. If we assume a speed of 30 miles per hour and a hauling range of 120 miles, then the truck might have a running time of 4 hours drawing 250KW of power. That seems like enough. Future energy farms might be very large and remote. Transporting the energy in containers might end up being more economic than long electrical transmission lines. 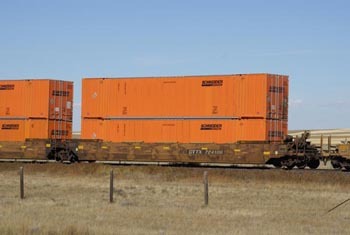 Shipping the containers in and out of the energy farm by rail should be quite efficient. Once the energy train reached towns, individual energy trucks would then move them to where they were needed. Large energy boats might also be used to haul a large number of containers from off-shore energy farms. 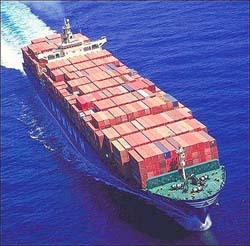 A single boat might haul 500 containers. I imagine these energy cargo containers to supply energy to whole communities. Assume each community household needs 25KW-hours of energy per day. A container holding 100MW hours would then provide a community of 100 homes, enough energy for 30 days. This seems like a reasonable period. What kind of energy density would be needed for these energy containers? Assume a container 40 feet long, 9.5 feet high and 8 feet wide. The total outside volume would be 3040 cubic feet. For 100,000KW-hours, the energy density would have to be 33 KW-hours per cubic foot or 1.1KW-hours per liter or 4200K joules per liter or 4.2MJ per liter. In comparison, a lithium ion battery stores about 1MJ per liter. Gasoline is about 34MJ per liter. Coal is about 20MJ per liter. So, the energy container would need to store more than a battery but much less than conventional fuels. I think in time, super capacitor technology will be able to achieve this kind of energy storage density.